I picked up Lost Angel Pinot Noir 2011 at a little wine shop about 30 minutes north of my house. The shop has a small, rather generic selection, but I like to stop in once in awhile because I generally will find a bottle that isn’t on the shelf in my usual shops just yet. Lost Angel is a label of Foley Family Wines, which was founded in 1996 by vintner William Foley II. Foley Family Wines encompasses vineyards in California and the Pacific Northwest and includes brands such as Sebastiani Vineyards, Chalk Hill Estate and Three Rivers Winery. Each property is committed to sustainable farming practices, and of great importance to Foley is “the average American wine lover” who enjoys well-made wines ranging in both style and price. 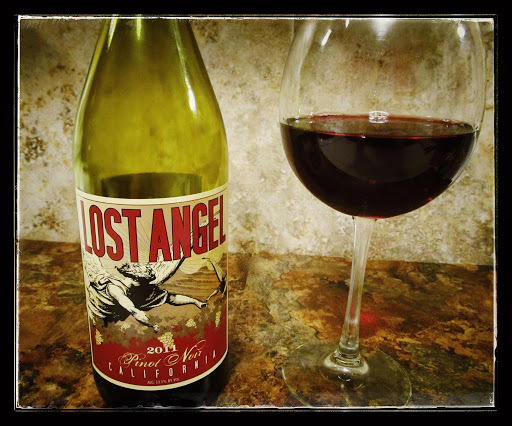 The Lost Angel brand was developed to “create bangin’ wines that seduce the palate with scandalously good flavors”. Bright ruby red in colour, after aerating aromas of cherry and balsamic swirled about in the glass. Pleasantly astringent green tea tannins supported concentrated cherry flavours in the light to medium body. Black cherry, white peppercorn and balsamic elements comprised the moderate finish. Simple and easy drinking, it is an agreeable, everyday glass for the table.